There are some needs that women in labour have that are the same for women anywhere in the world. These needs are dictated by women's physiology both as a mammal and as a human being. They are the universal basic needs of a woman in labour. Considering how you might go about meeting these basic needs is an important aspect of your decision making process when planning where to give birth and with whom. As early as the 1960s, the affect that fear and the body’s subsequent release of adrenaline could have upon labour was beginning to be understood. A perinatal psychologist, Niles Newton, studied what happened when pregnant mice were disturbed during their labours. He found that if the pregnant mice were disturbed during labour, their labours increased in length by up to 70%, and some mice didn’t even give birth at all. Interestingly there was a different effect if the first of the litter had already been born. The rest of the babies had very fast births and simply by disturbing the mice during labour the overall chances of the baby mice dying increased. When mammals feel threatened, hungry or cold, their bodies release adrenaline. Adrenaline stops the release of oxytocin. During labour, oxytocin is the hormone which makes the uterus contract. If oxytocin levels fall during labour, contractions will slow or halt and the circular muscle fibres of the cervix, tighten. This is a clever survival strategy to allow a mammal in labour to get away from the threat, and labour and give birth somewhere safer. If adrenaline can stop labour contractions, then a basic need of a labouring mammal is to experience minimal adrenaline release. She will need to be somewhere she feels safe, undisturbed and warm. These are the basic needs of a mammal in labour and women are mammals. Human beings are very special mammals due to the unique capacity of the human brain for conscious awareness. Our minds make us unique amongst mammals. They are an extraordinary gift of the evolutionary process. However, during a physically intense and involuntary process such as labour, a busy, reflective mind can be a handicap. The mind's constant reflection upon the intensity of the labour and how it’s going, makes labour challenging for women, rather than the physical experience itself. Thankfully, women’s bodies have a design solution to this ‘handicap’ in the form of birth hormones. 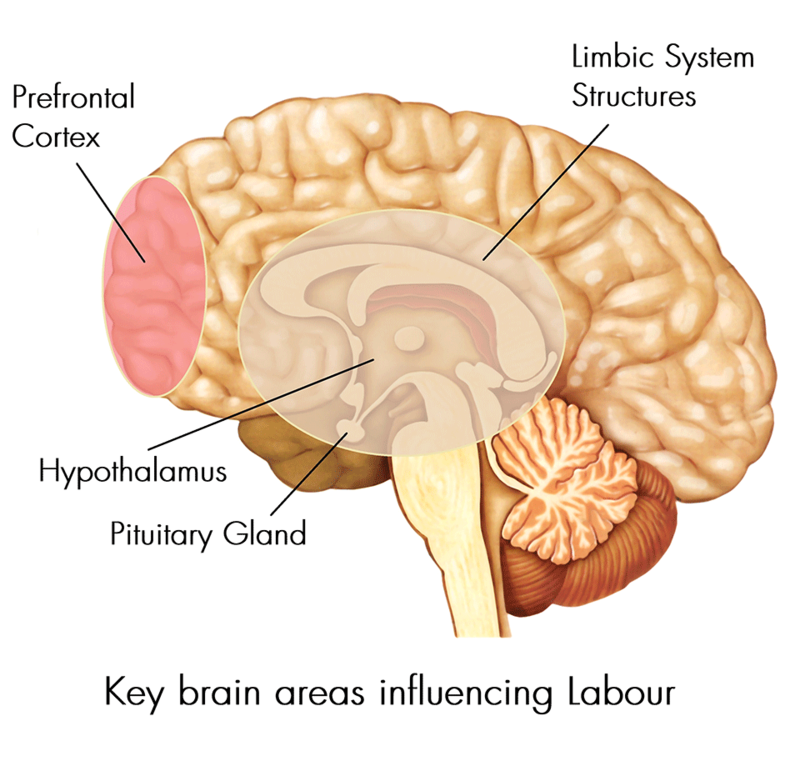 Labour and birth are involuntary processes controlled by hormones from ancient parts of the brain, namely the Hypothalamus and the Pituitary Gland. During labour, these ancient limbic system structures are the most active. This is a reversal of the way the brain operates in everyday life. Every other day of a woman’s life, impulses from the limbic system are inhibited by the pre-frontal cortex. The pre-frontal cortex is a part of the brain which is responsible for our abilities to focus our concentration, plan ahead and behave appropriately for a given situation, amongst other functions. The pre-frontal cortex does this via nerve projections which go down into the Hypothalamus. The frontal cortex prevents behaviours which might be considered socially inappropriate or anti-social. In simple terms, 70% of the brain is there to inhibit the other 30% of the brain. We can see this effect clearly in people who have experienced damage to their frontal cortex. They often exhibit uninhibited sexual, social and hyper-aggressive behaviours. In labour, inhibitory control of the limbic system by an active frontal cortex is problematic, because it is precisely these parts of the brain which are running the show. The Solution: Increasing oxytocin levels in the woman’s blood stream during labour, produce more intense uterine contractions. The nervous system responds by releasing higher levels of endorphin, the body’s natural opiate and pain killer. Oxytocin and Endorphin are also released directly into the woman’s brain. They impact by quietening activity in the frontal cortex, reducing its capacity to inhibit activity in the brain systems which drive labour. When researchers have measured electrical brain activity in labouring women using Electroencephalography (EEG), they have detected very low brain wave frequencies in the Delta region. These brain wave patterns are normally found in adults in deep sleep states or in young babies. These changes in the brain as the woman adapts to her labour, bring about an altered state of consciousness. When the frontal cortex loosens its inhibitory control of the limbic system, women’s behaviour changes. A labouring woman might close her eyes and stop talking. She might begin to moan and sway rhythmically. In this altered state of consciousness, women have more similarities with other mammals; they behave instinctively without inhibition. This altered state of conscious protects the woman from consciously reflecting upon the intensity of her labour. It renders the labour neither easy nor hard, it simply IS. Instinctive human behaviour is fragile, because the frontal cortex is generally very good at inhibiting these sorts of behaviours. The frontal cortex can be reactivated by any kind of sensory disturbance to the woman. If this happens, the protective altered state of conscious of labour, will diminish and the woman’s mind will once again begin to reflect upon the intensity of her labour. It is clear then that labouring women have basic needs in addition to those of other mammals, because of the reflective nature of the mind. Labouring women need to be protected against any sort of useless reactivation of the prefrontal cortex. The main stimuli for prefrontal cortex activation are: the use of language; the presence of light; the feeling of being observed and the perception of danger. Warmth, safety and minimal or no disturbance. When planning your place of birth, it might be worth considering how you might be able to incorporate these features into the room or space in which you will have your baby and who might be able to help you to do this. Buckley, S. J. (2010) Sexuality in labour and birth: an intimate perspective. In D. Walsh and S. Downe (eds) Essential Midwifery Practice: Intrapartum Care. London: Wiley-Blackwell. Erwin, E. and Hughes, C. (2013). The birth environment: empowering midwives to promote normal birth. Essentially MIDIRS, Vol.4, No.2, February 2013. Hutton, J. (1986). The problem patient. Induction and augmentation of labour. Current Therapeutics 61-74. Newton, N., Foshee, D., Newton, M. (1996a) Experimental inhibition of labour through environmental disturbance. Obstetrics and Gynecology 27(3): 271-376. Newton, N., Foshee, D., Newton, M. (1966b) Parturient mice: Effects of environment on labour. Science 151(3717): 1560-1561. Newton, N., Peeler, D., Newton, M. (1968) Effect of disturbance on labour: Experiment using one hundred mice with dated pregnancies. American Journal of Obstetrics and Gynecology 8: 1096-1102. Newton, N. (1986) Special issues in nurse-midwifery: A look at the past and future. Journal of Nurse Midwifery 31(5): 232-239. Newton, N. (1990) Newton on Birth and Women. Selected Works of Niles Newton, both classic and current. Birth and Life Bookstore. Seattle, Washington. Odent, M (2001). The Scientification of Love. Free Association Books: London. Odent, M. (2011). Childbirth in the Age of Plastics. Pinter & Martin Ltd: London. Sapolsky, R.M., (2005) Monkeyluv and Other Essays on Our lives as Animals. Scribner, New York. Simkin, P. (1986) Stress, pain and catcholamines in labour: Part 1. A review. Birth 13(4): 227-33. Spivak, L.I., Bechtereva, N., Spivak, D., Danko, S. (1998). Gender-Specific Altered States of Consciousness. The Journal of Transpersonal Studies, 1998, Vol.17, No.2, 181-185. Spivak, L.I., Dan’ko, S.G., Spivak, D.L., Medvedeva, T.G. and Bolotskikh, V.M. (2001) Some Neurophysiological Correlates of Altered Mental States in Labour: Report 11. Features of the Superslow Phasic Processes. Human Physiology, Vol.27, No.2 pp.165-170. Uvnas-Moberg. K, (2003) The Oxytocin Factor: Tapping the Hormone of Calm, Love and Healing. Cambridge MA: Da Capo Press. Walsh, T. (2009) Exploring the effects of hospital admission on contraction patterns and labour outcomes using women’s perception of events. Midwifery, 25: 242-52.
including minimal use of language, minimal light and the removal of all non-beneficial forms of observation.